REIGNING titlist Petron outplayed and outmuscled Smart, 25-23, 25-14, 25-18, to stay unbeaten and forge a triple tie for the lead in the 2018 Philippine Superliga All-Filipino Conference on Thursday at The Arena in San Juan City. The Blaze Spikers the Giga Hitters side of returning coach Roger Gorayeb a first defeat in just 75 minutes as skipper Ces Molina led the charge with 16 points built on 11 kills, three service aces and a pair of blocks. Aiza Maizo-Pontillas delivered 12 hits including 11 digs and four excellent receptions in the Blaze Spikers’ third win in as many games, tying Foton and F2 Logistics, which it will battle on Saturday at the Alonte Sports Arena in Biñan. Mika Reyes and Sisi Rondina were also instrumental for the team, chipping in 11 and nine markers, respectively, while playmaker Rhea Dimaculangan had 30 excellent sets on top of four points. Despite committing only 10 errors in the match, Petron head coach Shaq Delos Santos admitted that he was worried about their slow start. 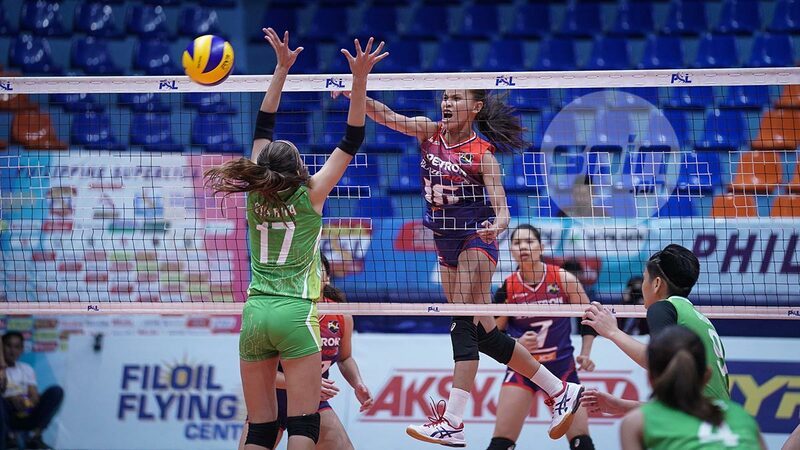 Smart tries to regain its winning ways against Foton (3-0) on Tuesday next week in the same venue in San Juan.